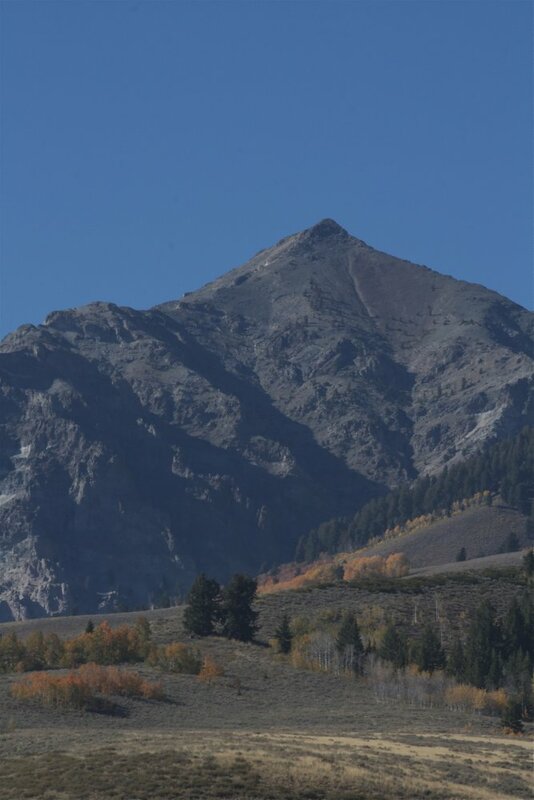 While the kids slept in their car seats, we did our best not to wake them, but around every corner a new picture unfolded, aspen, birch, and willow groves, the evergreens, and the jagged peaks of the Sawtooths. Eventually, we pulled over to let them enjoy some of the splendor we had brought them to see. As we drove up an dirt side road, we were stopped by a herd of sheep being brought down from their summer pastures by a cowboy and his sheepdogs. Signs of autumn abounded. Pronghorn antelope graze alongside the road around a few more turns in the road. We found a campground for the night along the Salmon river. The steep valley slopes obscured the sun early and after a couple long days on the road we put the boys to bed early, and soon fell asleep ourselves. The cold was the first thing we noticed when we awoke. Ice and frost coated everything and our digits quickly froze. Two cold frozen and unhappy boys encouraged us to pack early to find a sunny spot for breakfast and fortunately only a few bends further down the river we found a spot where the sun already had begun to warm and melt the frozen world we awoke to. 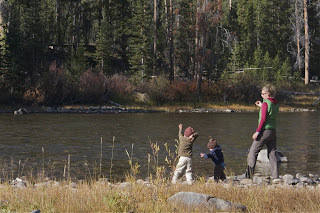 After a warming breakfast, the kids frolicked in the sun, throwing rocks into the river. I wonder whether there is an innate urge to pick up rocks and hurl them into water? It seems as though they could spent hours just scouring the river's edge finding the right stones to pick and throw. Only a couple days into our journey and we've already found autumn. We wonder what lies ahead and whether it can match the splendor we've already experienced in the Sawtooths. We continue north to find out. You have some beautiful images with your posts - very nice to look at. We hope you enjoy your time here in Idaho and, if you head toward us in Riggins, we've got some nice climbing spots you may enjoy. Drive safe and enjoy the trip!